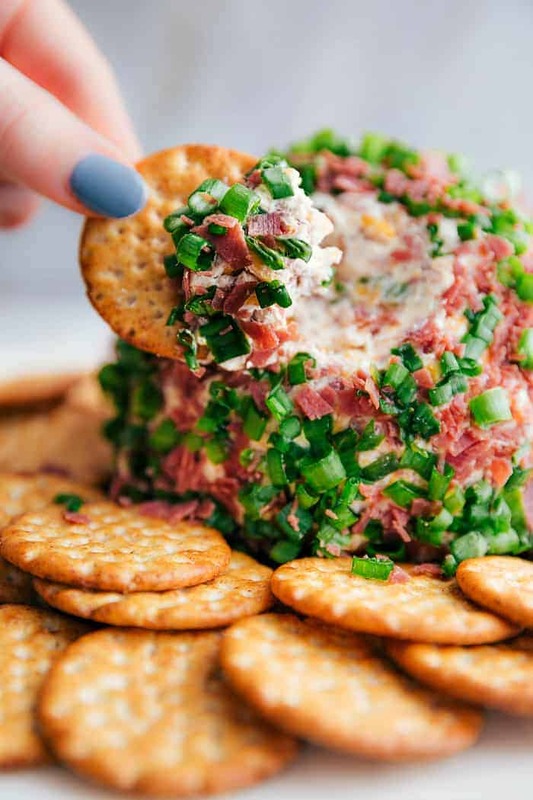 Chipped Beef Cheese Ball is such a classic and amazing cheeseball filled with cheddar cheese, cream cheese, green onions, and dried beef. This easy cheese ball is going to be the hit at any gathering! If you are looking for an awesome cheese ball recipe you have come to the right place. You should also try this Bacon Ranch Cheese Ball, Jalapeno Bacon Cheese Ball, or this Pineapple Cheese Ball. We have almost survived the craziness of the holidays. I love this time of year but man, it is so busy! Between holiday parties, school activities, and dance performances, we have barely had a time to breathe. I can’t even believe how fast Christmas has snuck up on us and is only days away. One thing that I love to take to a holiday party is a cheese ball. They are simple to make and always the biggest hit. 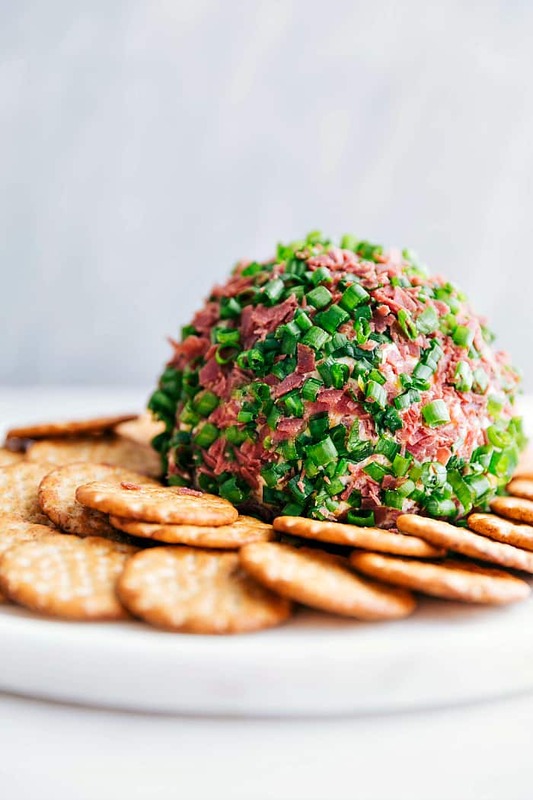 I have so many delicious kinds of cheese balls on the blog, but this chipped beef cheese ball is a classic! How do you make a chipped beef cheese ball? In a large bowl, add the cream cheese, chipped beef (reserving about 1/4 cup), green onions, cheddar cheese, Worcestershire sauce, garlic powder, and salt. Mix together until incorporated. Roll into a ball and wrap in plastic. Chill for at least an hour or until firm. 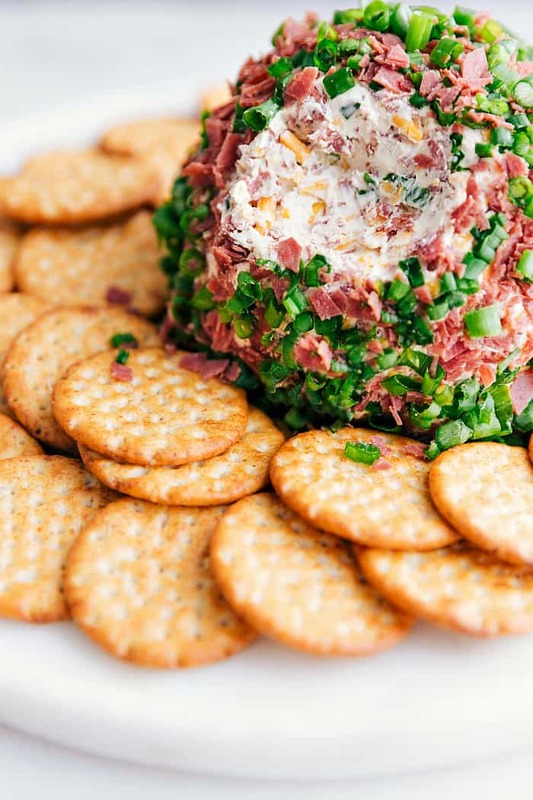 Unroll the cheese ball from the plastic wrap and roll in reserved chipped beef and green onions. Serve with crackers. HOW TO ROLL A CHEESE BALL? When rolling Cheese Balls I find it easiest to transfer the mixture onto a section of Saran Wrap, then pulling the corners together and twisting it to easily for a ball with minimal mess. Then by either cutting the wrap at the base of the twist, or by simply untwisting it to transfer it to a serving dish. Chipped Beef is a form of pressed, salted and dried beef that has been sliced into thin pieces. The modern product consists of small, thin, flexible leaves of partially dried beef, generally sold compressed together in hard or flat in plastic packets. How long will a homemade cheese ball last in the refrigerator? The main ingredient in a cheese ball is cream cheese, which lasts for a week or two in the fridge once it is opened. If you are adding things to a cheese ball like fresh herbs, diced fruit, or perishable ingredients, the storage life may be as little as 24-48 hours. Can I freeze a cheese ball? Yes you can freeze a cheese ball. It makes it easy to plan ahead for the holidays or other occasions. 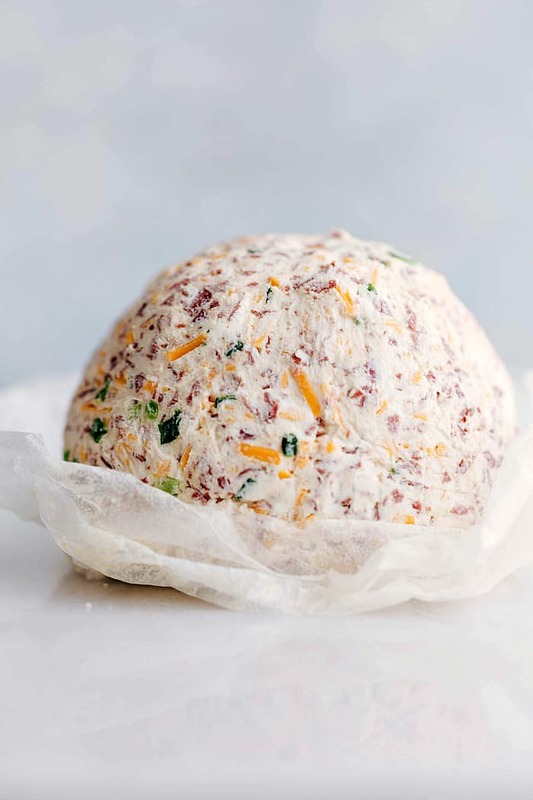 To prepare them for the freezer, make the cheese ball and wrapt them tightly in plastic and place them in a freezer safe bag. If you are adding a coating, then add that before serving. In a large bowl, add the cream cheese, chipped beef (reserving about ¼ cup), green onions, cheddar cheese, Worcestershire sauce, garlic powder, and salt. Mix together until incorporated.